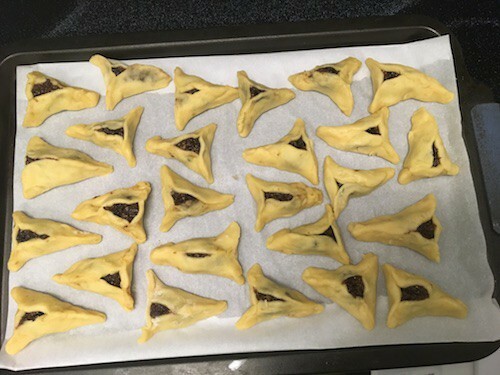 The legendary baker Faye Davis-Rapp shares her Moroccan Boyozas and Hamantaschen recipes with Voice4Israel just in time for Purim. Fanny (Faye), née Migueres, Davis-Rapp was born to a Sephardic family in Fez, Morocco. 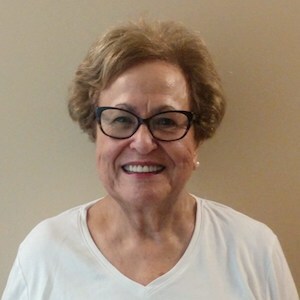 Davis-Rapp moved to England and then Seattle WA, where she lived for 43 years, before moving to Chapel Hill, NC. The tradition passed on to me by my parents was that when a woman marries she adopts her husband’s customs. So although I kept making traditional Sephardic foods, I also learned to make traditional Ashkenazic foods. 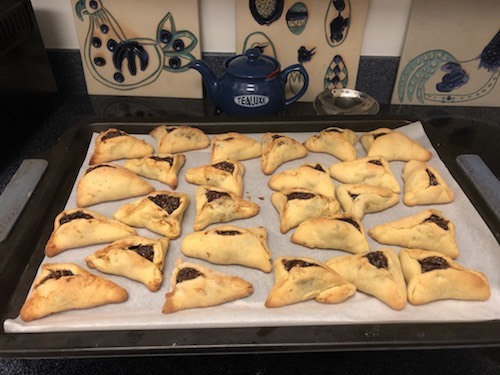 For Purim, I’m sharing two recipes: Boyozas and Hamantaschen. Boyozas are small round loaves of bread with a whole raw egg latticed with dough strips on top, one egg for children or 2 eggs for parents. Some people call this loaf “Challah” and throw away the egg reflecting the sacrifice of the Beit Ha Mikdash. 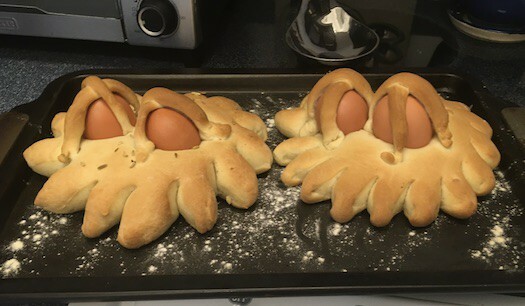 Others, as in my tradition, will throw the lattice but eat the eggs, sandwiched in the bread. My mother would combine the following ingredients in a large mouthed clay pot called a Sf’na. My mother would briefly knead the dough after the first rise and then split it into 4 portions (3 smaller and 1 larger as we were a family of 5). She would then flatten each piece to make a circle about 1/4 inch thick. With scissors she would cut inwards about 1 1/2 inches all around the circle, then pinch the ends of the cut pieces. 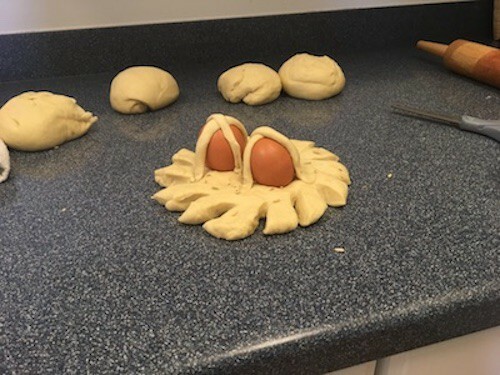 A washed and dried egg was then placed in a dip in the center of the circle (I pierce my eggs with an egg piercer or a pin to avoid the egg bursting in the oven) carefully so as not to break the dough underneath the egg. 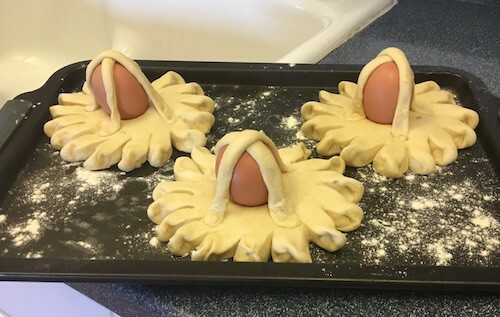 She would then drape the eggs with two thin strips of dough to form a cross on the egg, fusing the ends of the strips with the dough of the main circle with moistened fingers. This oven, adjacent to to the synagogue, was also used to bake challah bread for Shabbat. And once the challah were removed, the Shabbat Cholent was placed in the oven to cook slowly until lunch the following day. Moroccan cholent is known as “Shkheena”, from the Arabic word “hot,” or with a French twist, “Dafina” or “La Daf.” The shkheena was delivered to homes following Shabbat services a hot meal. My grandfather, Haim Cohen, would kosher the oven before Pesach so that matzah could be baked for the neighborhood, under his strict supervision. In 1998, I visited my old neighborhood, and saw that the synagogue was being renovated and is now a UNESCO protected site. In the absence of a community oven, I preheat my oven to 350 degrees and bake the Boyozas for 20-25 minutes. With its origins in Germany, I had never heard of hamantaschen in Morocco. Once I learned about them I put my baking skills to use to come up with my own recipe. In an electric mixer, beat the butter/margarine, Crisco, and sugar. Add eggs and mix well, then add orange zest and juice until incorporated. Pour in flour mixture, keep stirring until soft dough in formed. Wrap dough in plastic and refrigerate up to 24 hrs. Roll to ¼ in. thickness, about 3.25” diameter. 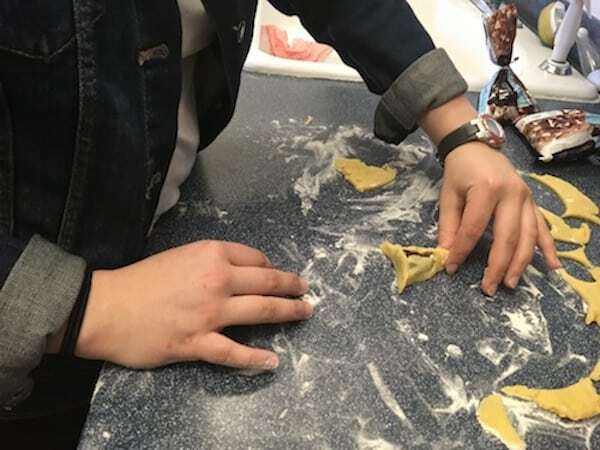 Place one teaspoon of the filling of choice in the middle of the round shape and fold the sites to form a triangle. Fillings include any fruit preserves, to which chocolate chips or nuts or both can be added. Dried fruit (including figs, prunes, cranberries, dates, raisins), mixed with orange juice and peel, can be puréed in a food processor. Lemon juice, chopped nuts, and/or cinnamon can be added to taste. Poppy seeds, a traditional filling, can be used from a can or freshly cooked in water and sugar, with orange/lemon peel.